The Skinny: Jordan Chan and Patrick Tam turn in good performances in this competent, but unrealistic triad drama. This is not a special film, but fans of the stars could do worse. Jordan Chan is Cho, a recently released ex-con who was convicted of a triad killing. His incarceration was unjust, since he wasn't the true culprit. The true killer was childhood buddy Dik (Patrick Tam), but Cho took the rap for his pal, thus paving the way for a long prison sentence. Having spent the majority of his adult life behind bars, Cho isn't too eager to return to prison, and thus wants nothing to do with the triads. The reverse isn't true: Dik misses his old pal, but Cho is still resentful that Dik never visited him in prison. Dik did, however, keep tabs on Cho via a nearby apartment and a telescope. He acknowledges that Cho doesn't want the triad life anymore, but wants to help his buddy out in any way that he can. Though he's initially hesitant, Cho is genuinely touched by his old pal's stalking technique. He agrees to let Dik bankroll a new restaurant, and installs himself as the head chef. Life seems good, as he's able to help out his long-suffering sister (Amanda Lee), and even meets the attractive San (Cherrie Ying). And, he and Dik manage to regain their old friendship. Still, this is a triad drama, so things begin to turn sour. 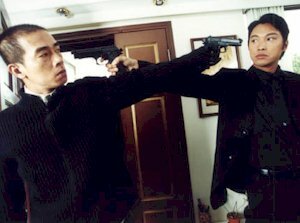 Cho begins having doubts about Dik, who appears to enjoy the violence of triad life a little too much. He also gets approached by the cops, who are led by the laughably intense Simon Lui. They threaten to send Cho back to jail if he doesn't become their mole. It also turns out that San is the mistress to Mr. Fong, the head guy in Dik's triad. And, unsavory triad types harass Cho in his restaurant. Poor guy. The script (by Simon Lui, Kelvin Lee and director Marco Mak) is remarkably competent, considering that the conflicts and characters are typical genre types. The Dik/Cho dynamic remains interesting throughout, thanks to a few effective plot points and the dignified performances of the lead actors. Jordan Chan and Patrick Tam give so much weight to their standard genre characters that it's almost uncomfortable. Had the filmmakers overemphasized the homoeroticism and added some over-the-top gunplay, The Wall could have been a low-rent version of John Woo's A Better Tomorrow. However, current triad dramas tend to be restrained and respectful, and director Marco Mak follows suit here. The build-up to Cho and Dik's seemingly-eventual showdown is subdued, and depends on character and performance to get the job done. As such, the filmmakers are only partially successful. While the performances are fine, the characters have a hard time maintaining credibility. Cho says he wants to stay out of trouble, but he spends all his time with triads and continues a relationship with his boss' girlfriend. Given the film's deliberate development of plot and character, Cho's actions seem incredibly unrealistic - not to mention idiotic.